The National Water and Climate Center produces this weekly report in cooperation with the National Drought Mitigation Center and other Federal agencies. The report focuses on precipitation, temperature and snowpack conditions in the western U.S., and provides a national drought summary. Snow Telemetry (SNOTEL) month to date precipitation percent of normal shows that the central and northern Rockies have received abundant moisture. 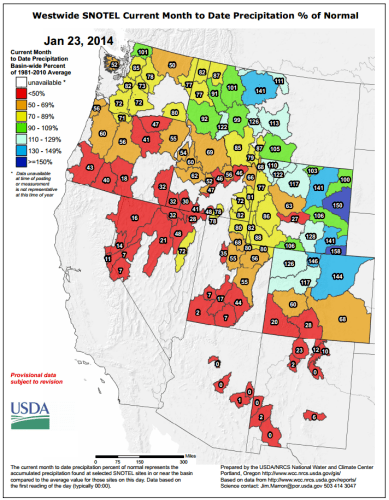 Significant deficits dominate the remainder of the West; especially over the southern Cascades, Sierra Nevada, Great Basin, Four Corners region, Arizona, and New Mexico. Want to get updates delivered to your inbox? Click on the Follow tab in the lower right corner and enter your email address.